As we move into the spring, the longer days trigger more and more singing behavior from the birds. Resident birds start singing in Feb and March. In April and May, returning breeders add to the chorus. Some birds that only migrate through mid-Missouri may sing as they travel too. While adding to the atmosphere of the backyard, the singing behavior also helps birdwatchers locate birds that may otherwise go unnoticed. Males do the most singing, with the primary function being to establish and defend their feeding and nesting territories. 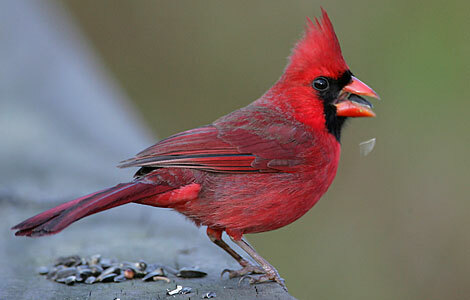 The singing behavior also helps them to attract a mate for nesting, so singing is most intense during the spring. Sometimes males and females will sing back and forth to each other. As we move into the summer, they will begin singing less as the urge to defend the nest wanes when young begin to fledge. In late summer, you may hear some unusual songs as young birds try to find their voice while singing songs from the adults. In the fall some resident birds like the Carolina Wren continue singing to establish and defend their winter feeding territories. Bird sounds can be sorted as songs and calls. Songs tend to be more complicated, musical renditions that are typically used to establish territories and attract mates. Calls tend to be shorter, harsher notes that fulfill different functions. For example, the chattering scolding of chickadees towards a roosting hawk is an attempt to get it to move out of the area. Family groups and migrating flocks communicate with short call notes as a way to stay in touch with their locations and to warn of predators or danger. During the fall months when birds are singing less, these call notes can often help locate birds. Most birds try to stay hidden to help them survive, so learning bird sounds can help you identify the species when you can’t get a good look. Start enjoying your bird symphony today!